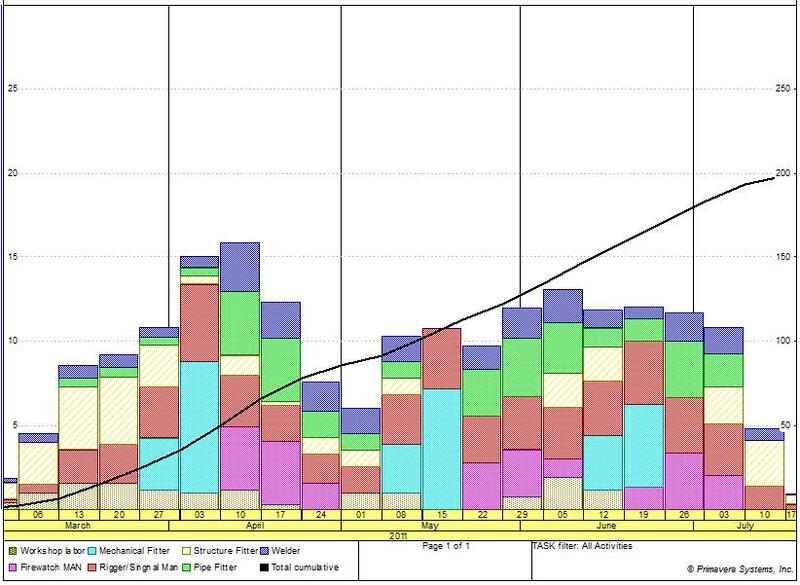 The resource histogram allows us to use projected and historical actualized data to trend resource quantities, resource hours and cost in future. It also allows us to determine the potential risks of excessive supply of resources or lack of resource requirement. (3) View resource loading histogram/S curve. 1) How to allocate overall resources and cost? A blank project resource dictionary only will be displayed if no resource has been added to current project. See below image. Select “Auto- compute if you want actual units are updated by Primavera or select “Do not auto-compute actual” if you can update manually for actual man hours spent. After entering of all data, you will notice that the newly added resources are not in the desired location. Therefore, allocate those resources according to their resource level. For example, Pipe fitter, Rigger/Signaler, General worker, Fire watches man, Workshop labor, Painter, etc are allocated under construction department of Petrochemical Projects. See figure below. 2) How to assign resources in activity detail section? Go to Activities page > Select the activity > Go to Resource tab which is next to Relationships tab > Add Resource which is located near the bottom of activity detail box > Select required resource and assign it. You may also assign resource details such ; resource curve, budgeted units and actual units. 3) How to view and print resource histogram and S curve? (a) Go to Activities page > Select Resource usage profile, and then you will see “Current Project’s Resources” Column on the left and histogram and bar chart on the right side of the layout. The individual loading chart, for instance, welder’s resource profile is shown in the following figure. Remember that you are not able to view both materials and labor or non labor histogram bar chart at the same time as they do not have the same unit of measure. You will be able to view material resource curve, both labor and non labor curve , labor or non labor curve each time individually. 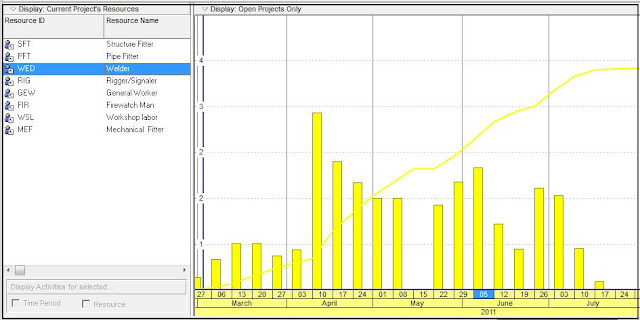 b) You can customize the appearance of bar chart by the Resource Usage Profile Options. 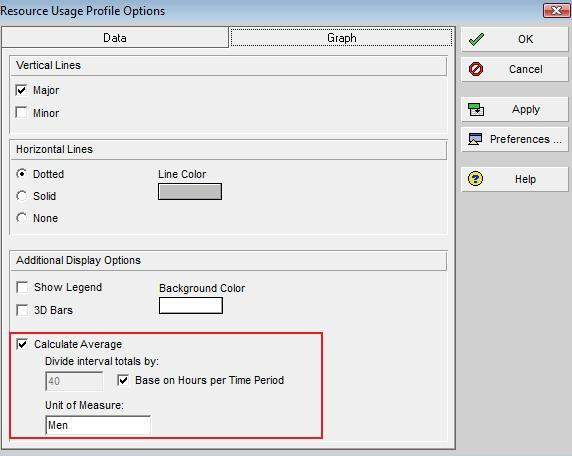 Right Click on the bar chart area to find Resource Usage Profile Options. 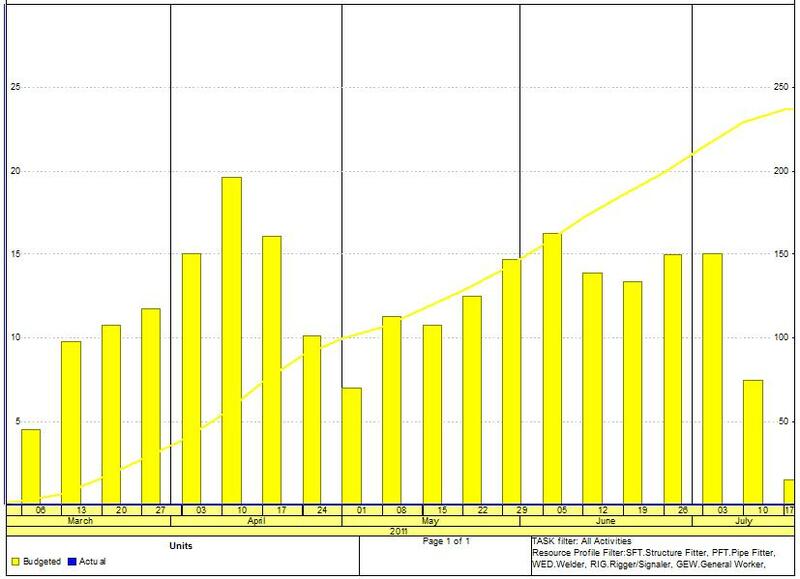 You can select “By date” to see interval data (Histogram Chart) and select “Cumulative (S Curve) to see total manpower unit in the following check box below. c) The following check box is used when you want to show manpower resource profile instead of man hour unit. P6 will calculate total men per period (interval) based on working hrs per period (interval) and total man hours per period. For example, total men per week would be 10 when total man hours for a week are 400 and 40 working hrs per week. d) And then, select all resources in resource column to view overall man power allocation. To print the bar chart, Go to print preview > page set up > Options > Select “Profile” and unselect Activity Table, All columns, Grid lines and Gantt chart. Set the time scale start from “PS-Earliest Project Start” to “PF-Latest Project Finish”. Finally you will see the bar chart as below. e) According to above bar chart, the weekly interval manpower is shown on the left side and total manpower allocation is on the right side. f) One of the reason for viewing resource histogram is to identify overallocated resources against the available resources. To view any overallocated resources in your project, go to Data tag on "Resource Usage Profile Options" window, then select Show Limit and Show Overallocation. 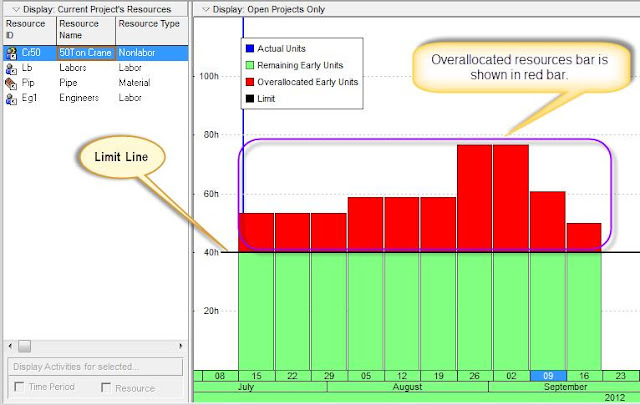 Any resource unit above the limit line (black line) is over allocated. Normally, overallocated resource is shown in red bar. see below snapshots. How to view "Stacked Histogram? You can also see “Stacked Histogram” for this manpower allocation. Right Click on the bar chart area to find “Stacked Histogram”. Firstly, click on "Stacked Histogram" tag, and then you can go to "Resource Usage Profile Options" to get screen shot in step-g. See figure below. Go to Resource Profile options > Assign Resource Filter/Group Name > Select Total cumulative curve as shown in Figure below. Finally, you will get Stacked Histogram as shown in below. The stacked histogram represents the manpower allocation by individual trade/discipline for a particular period as well as total manpower allocation (total manpower = 200 men, see the following figure) for all time . It can be printed the same way done on item 3, d.
When Stacked histogram is viewed, one thing to take note is "Overallocated Resource" can't be identified on that view. Switch back to normal histogram by deselecting "Stacked Histogram" so as to analyse overallocated resources. Are you working on multiple projects environment ? Go to "Open" select all projects that you wish to view resource profile by pressing and holding control key if you are handling multiple projects. There are the related posts (1) Tutorial-How to generate S curve/histogram from Primavera, P6 which describes how the progress (histogram curve/S curve) are produced using P6 export excel data (2) Creating discipline wise manpower histogram using Primavera P6 export data . i have attached screen shot what i get. Azhar, if you don't see the Total Cumulative curve, your resources are material. 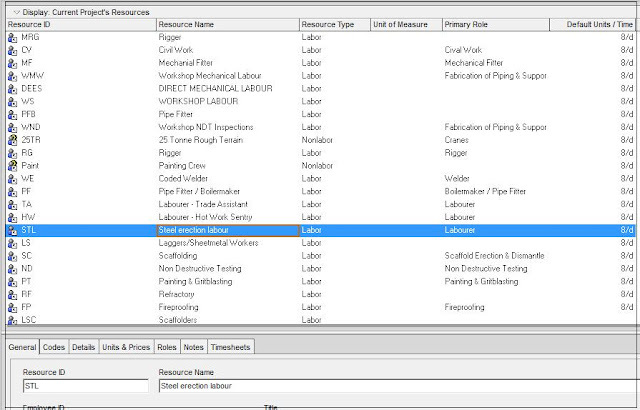 you need change their type to Non-Labour or Labour resource. This is based on P6.0. I think you probably couldn’t find “Stacked Histogram” and “Resource Usage Profile Options” tag as shown in step-f. (I have added the new screen shot for better understanding). If you can follow step-f, step-g can be done easily to assign “Resource Filter/Group Name” which will bring you to produce the S curve/Stacked histogram. Stacked Histogram and S cuve would be produced if you select “Total cumulative curve” (See step-g). If you select on “No cumulative curve”, the Stacked histogram only will be displayed. For the "Stacked Histogram" to show up, you need to use a filter to add specific resources. 2 - On the data tab, on the "Select Pattern/Color" section, Click Add, to add a filter on the resources defined in your project. Do a separate filter for each resource you want to show on the Stacked Histogram. 3- On Filters Dialog, Filter Name should be a descriptive label for the resource in question. Select the resource by "Resource ID". 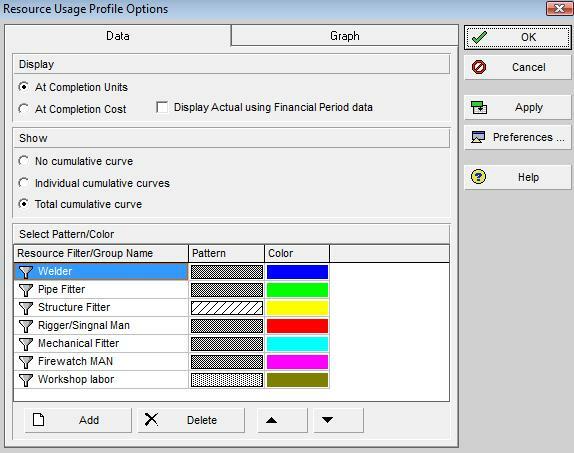 4-Now you can choose a pattern and color for this resource on "Resource Usage Profile Options" . 5- Repeat the same for other resources ( a single resource each time). Hey, this is Kushal this side. I am using P6.2 Version. I get stuck up when I try to go for Future Period Bucket Planning. I allocate the resources, attach a curve to the resource for an activity, but when the Resource Usage Spreadsheet is opened, I don't find the activity cells for any period to be manually editable. I have tried many a times but have failed eventually. I read in the P6 help that the cells have to be white instead of grey for manually editing the resource distribution for the period. What is the concept of this, can anybody please help me out in this regard. I learned your tips for manpower stack histogram, however i find difficulty during Print set up. I would like to ask how to increase the font size of the scale (for manhours & cummulative manhours) in P6. It can be done by adjusting scaling. Go to page tag under Page Setup. Then,select the appropiate scale. Normally,better result can be achieved by selecting more than 100%. I need a resource graph that shows linear feet over time. My objective is to determine how many crews will be need to lay various feet of pipe per day. I have primary resources assigned as well as material resources to each project. How do I show the both in the my graph? I need to display the graph as a stacked histogram. Thanks! 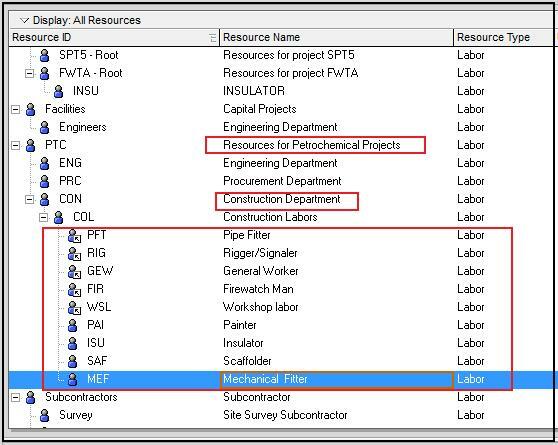 (1)Resource Assignment Window : Go to "Project", Select "Resource Assignment",bring out the "Curve" column, then fill down the selected curve type to all resources. (2)Global Change : Go to "Tools","Global Change", Create New Global Change query by selecting "Activity Resource Assignments" from "Select Subject Area" drop down list and Parameter is Curve = Bell Shaped. thanks alot. it was very helpful. What is the meaning of Primavera planning Level 1,2,3,4 ? how to plan quantity wise planning and scheduling ? 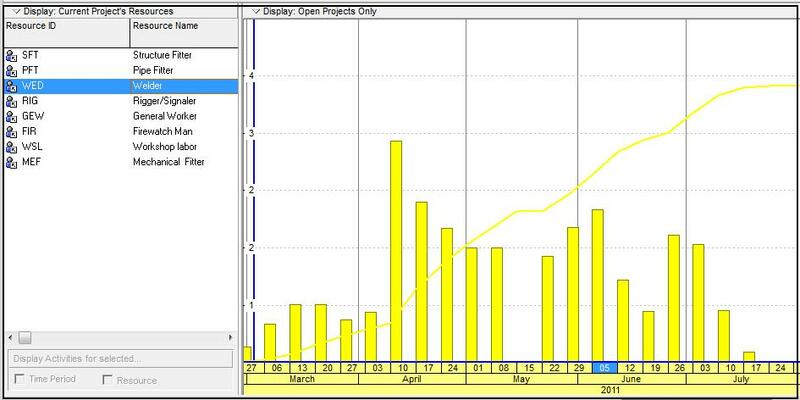 how to change y axis in resourse usage profile sheets.for egs my y axis shows 1000d ,2000d etc. Is there a way for P6 to calculate the manpower in number of craft and display on the curve? For instance, will P6 divide the weekly total hours by 50 hrs/wk to give a headcount? In P6 what is the default Resource curve? Thanks for your comments. The default Resource Curve in P6 is set to Linear Curve though no resource curve is assigned. Man hour is linearly distributed overtime which is the basis of overall manpower plan. i completed civil engineeriner 3rd year,i want to go coaching for primavera,is primavera useful in construction technology and project management or not? i am intrested to learn primavera. 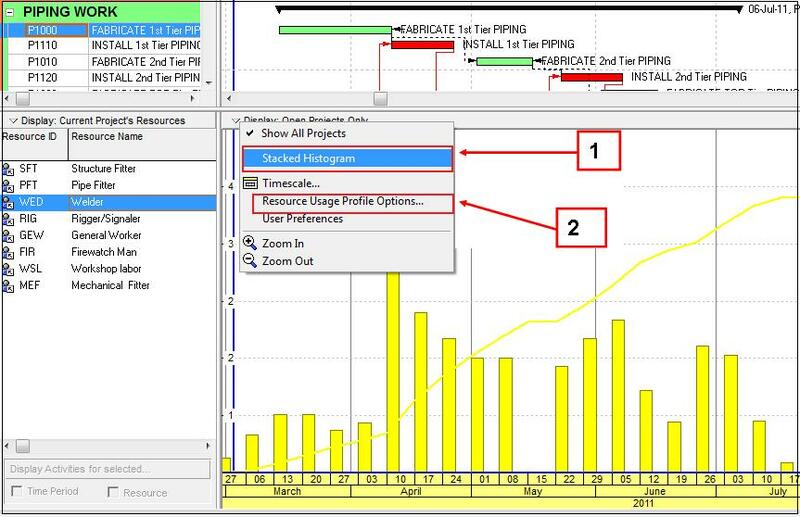 Most of the Oil and Gas project development and construction sectors have been using Primavera P6 for managing and the successful implementation of projects. I would say that Primavera is one of the most popular software in the market. Though Primavera is one of the most powerful tools, you need to know in-depth knowledge and skill in order to get the best result from Primavera. Most of the construction and project management companies are willing to hire project controls professionals, planners and schedulers who possess planning,scheduling and project controls experience with strong Primavera ability. Thanks for your valuable comments. Showing "limit" line (in black) on resource histogram doesn't mean your project resource is overloaded. 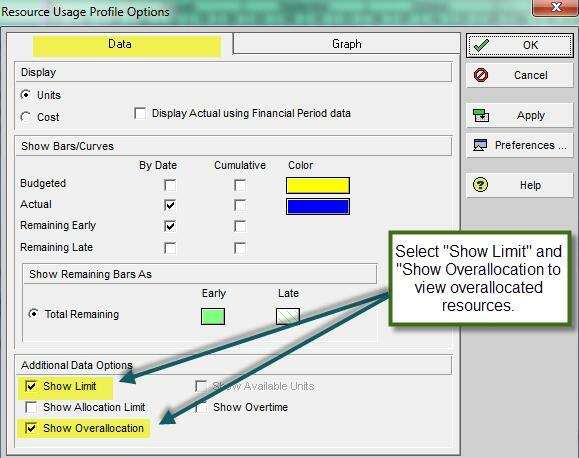 To see whether you are in an “Overallocated Units” scenario, check any resource bar that is above the limit line. If the resource bar is above the limit line, then your resource is overloaded and you are in an “Overallocated Units” scenario. To see "Overallocated Units" (in red bar), select "Show Overallocation" on " Data" tag,"Resource Usage Profile Options" window. Thank you for your valuable comments as well. I'm seeing that, indeed, I have some resources overllocated in my schedule. Checking the different options in Primavera I'm seeing that there is the "Resource Level" Option; but I'm not sure if this is the option I should use in order to solve this problem. What's your opinion about? (1)Prior to resource leveling, a couple of points need to be checked. (a)Have you declared resource limit for each resource in Resource Dictionary? If not, set the resource maximum available limit called “Max Units/Time”. P6 will indicate as you are in “Overallocated Units” scenario if resources limit (Max Units/Time) is less than the required unit (resource). (b)Have you checked resource calendar assigned to a particular resource? If resource calendar’s works hours/day is less than activity calendar, P6 will show your resource is overloaded. At least you need to know why P6 shows as overloaded before attempting to do leveling. If resource calendar is chosen not to be the same with activity calendar due to resource availability, then resource leveling work can be proceed. (2)If you are satisfied with all your resource and schedule setting, then resource leveling can be proceed using “Level Resources” form with caution. Try to work on small schedule so as to understand how P6 software works on leveling resource prior to working on complex project. (3)My best choice is not only to rely on resource leveling function provided by P6, but manual resource leveling method is preferred. 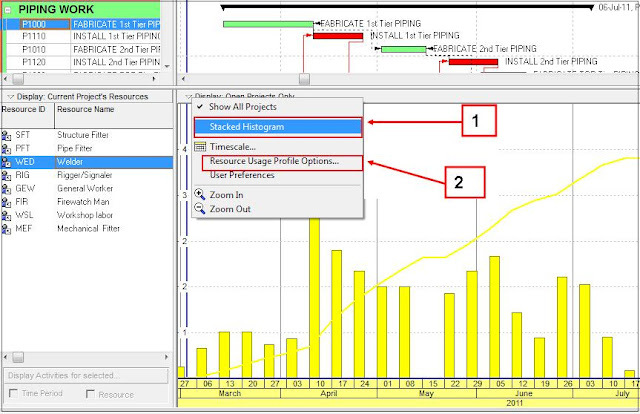 Example of manual resource leveling methods are changing resource curve, manual editing on the resource usage spreadsheet, changing sequence, increased working hours , extend the duration of a particular activity if appropriate, etc. I hope this will help you. Thanks for your quick reply. I'll use your tips to see if I could improve my resource assignment. Anyway, in your own experience, is it "normal" in your professional experience that you have to deal with resource overlocation? Yes,it is a normal work that used to be done. Using your advices, I think that I could manage the overallocation problem I had. Anyway, in one week time I'll have to check this schedule in a plant outage (BTW, the first one I will use Primavera to check). Thank you for that. 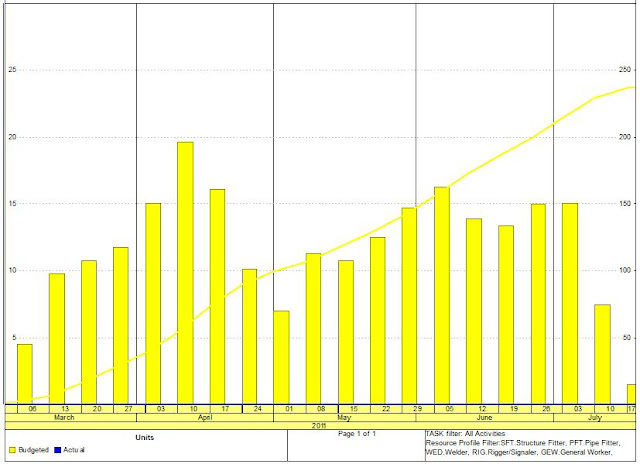 In Primavera Resource usage profile option, is there a way to adjust the chart scale ? it seems to auto adjust based on the bar heights ? Any ideas ? Thanks for your reply, It would be a nice option to lock down the "vertical" scale so week to week charts depict changes more easily. Zooming or timescale adjustments don't have the same result. I can edit as PDF or as JPEG, it's no Problem only an additional step. About the hours assignment in resources, I'm doing right now the analysis post-outage to check the real hours spent in activities versus the assigned hours. The problem I have right now is that in some activities I spent less hours than previously assigned and I want to finish those activities as such, for instance in one activity I spent 100 hours' resources even if I have foreseen 150 hours for this activity. When I try to finalize the activity (Status-Finished) then the software is doing it but with the original hours, in this case 150. Is there any way to finalize the activity without assigning the whole hours to it? Glad to hear that you have been working with resource loading in P6. If I understand correctly, you want to update the activity status with the actual hour spent (not the estimated or budgeted hours). According to P6 default resource calculation setting, when activity status is in-progress or completed, actual hours is atomically updated by P6 assuming that actual hour spent is the same as earned hours (% x budgeted hours)if you don’t enter actual hour by yourself. - Enter actual hours manually regardless of actual progress of the work. Now I'll begin with a big construction schedule (more than 2000 activities). I will contact with you to some issues that will raise during the preparation. You are welcome Glego. Let me know whenever you need help. I'm not able to display the stacked histogram (by resources) in my screen, and I'm following the steps you've shown us in this post. What could be wrong? It's the last step I need to perform to finish but I'm not able to understand why this is happening. If the normal histogram displays, the stacked histogram should be able to see. Check the resource filter again. Do you have video tutorials for Primavera P6? Hi,it is not available at the moment. I am a beginner user - From where should I start learning P6 in your blog? I can do the Gantt chart scheduling, but need help in resource allocation/costs/updating schedules etc. Hi,thank you for your comment. Try Primavera P6 Tutorial Tag to start learing all P6 tutorials. I had prepare a schedule ,can u suggest for loading resources,once after loading resources how to monitor and control the resource loaded schedule. How to Get Resource Loading Histogram/S Curve in Excel and how to export the date ? Please can you help on how to develop Early and Late Scure. Again please help on how to develop the forecast detail and forecast Scurve. Thank you. - On the left side of Data tag, select “Units” if cost data is not available. - Select “Remaining Early” and “Remaining Late” tip boxes on the Cumulative. Then you should be able to see Remaining Early and Late Curves. Please is it possible to load resources and do the normal scheduling without cost. Because in some organization they try hiding the resource cost saying we don't need it. Pls help on this matter. Thanks. As the main purpose of the execution schedule is to project the time and having cost loading schedule could result in distorting schedule’s accuracy (inaccurate project forecast completion date) if the cost-loaded schedule update is used to generate the progress payment. With these reasons, it is good enough to run fully resource loaded schedule to manage a project provided cost reporting system is available. As the resource loading can provide a projection of resource peak requirements. Therefore, it allows the project management team to identify limited resources and plan accordingly. You mentioned in one of your post above that if resource availability in resource calendar is less than activity calendar, P6 would show overallocation limit when checked. What happens if we decide the activity type as Resource Dependent? Again in most schedule i have seen, the activity type that is always used is Task Dependent type. Is it possible to use Level of Effort or Resource Dependent? If yes, please advice on when to use them if required for a schedule. (a) With “Task Dependent” activity type - P6 will show resource overallocation without extending duration of activity until such time additional resources are available. Therefore, use the “Task Dependent activities” when multiple resources assigned to the same activity need to work together. (b) With “Resource Dependent” activity type – P6 will still show resource overallocation but the limit of overallocation will be definitely lower than “Task Dependent” activity type. However, the activity duration will be extended until such time resource is available. So, use resource dependent activities when multiple resources assigned to the same activity can work independently. (2) There is no correlation between Level of effort (LOE) activities and resource leveling. It is not included in resource levelling as resources assigned to a LOE activity are not considered in calculation. LOE activities are simply used for on-going tasks that depend on other activities such as project management. Please this question has to do with updating the project. In Activity Detail, if one decide to use Physical as %complete type, do you update both the physical % and the actual labor unit captured. Please tell me how to update in primavera using this specification i mentioned because it is what is attainable to construction projects.Thanks in advance. If “Physical” % Complete type has been chosen to update the schedule, the following fields need to be updated in P6 so as to monitor where your project is heading to. (2) Actual Labour Unit - Manually need to enter actual labour spent as “Physical % completion” has no correlation with the activity’s duration or units complete. (3) Remaining Duration – Manually need to enter the remaining duration for the remaining works that need to be accomplished. Is there any way to generate a S curve without any resource or cost loaded??? Your S-Curve is a representation of the cost of your project. be it cash-in or cash-out. If there is no money involved, there can be no S-curve! Time is a resource without cost in or out. Tracking time is one way but usually its progress related to billing and quantitative survey as a more accurate alternative. I read most of the questions and answers on this page and I found it very useful and thanks for all your comments. Now, I’ve created a stacked histogram and I’m trying to show this Histogram just for “Early Remaining hrs” and not “At completion” hrs however I couldn’t find any option to do that. I'm glad that you found the blog is useful. 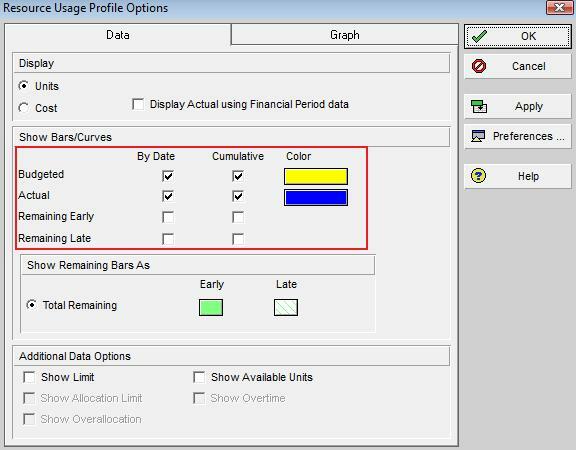 By default, resource profile for Stacked Histogram is displayed based on remaining early data using remaining early date. So, you don't need to find the option to do that. The only downside is that there is no option to see the Stacked Histogram using remaining late data. I think you get confused with Display Option “At Completion Unit” or “At Completion Cost”. Use this option when you want to show “Cumulative Curve(S Curve) data in cost or unit. I have a simple question for one activity say Block work i assign duration as 10 days and labor say masons 6 per day and total 60 for activity . After 7 days when i update as physical % complete as 50 % and manpower masons consume as 50.Then how p6 calculate the remaining manpower based on Phyiscal % or based on manpower consumed.